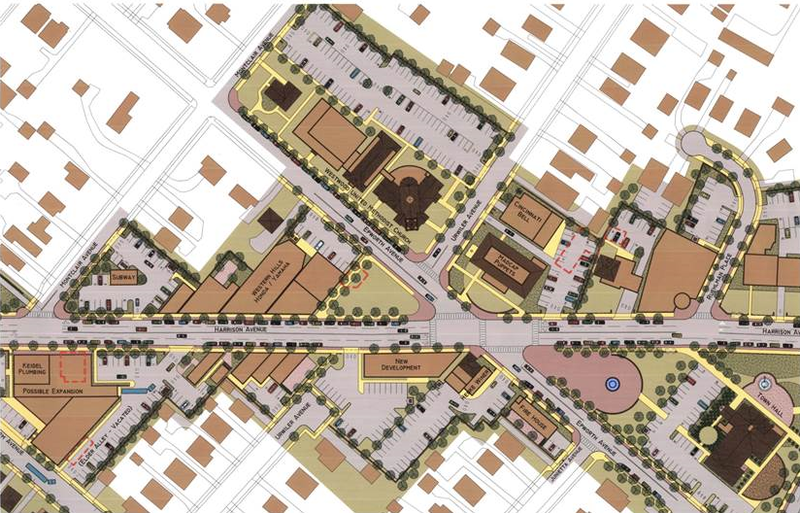 The Westwood Coalition submitted its approved recommendations to city officials today, including the adoption of the Triangle option, pictured here, corollary improvements on Town Hall grounds and throughout the historic business district, and a planning process for the implementation of the improvements. As we wrote in the transmittal letter to the Mayor, City Council, and department heads, we “…highlight the deep and wide participation of Westwood residents who have engaged richly in discourse about place making and the economic vitality of our neighborhood. We look forward to working with [the city] over the coming years as we bring these recommendations to life.” We also benefited from expert opinion that reinforced community insights and offered important perspective. After months of research and community input, the Coalition is very pleased to have the approval of community groups and residents. Now, our participating groups are rolling up sleeves to move from vision to planning to reality. The Triangle, and other improvements along Harrison Avenue between Kling and the Cheviot line, will take more planning, public-private partnership, funding, and time, but we are well on our way. On April 16, the Westwood Coalition hosted a community meeting. Guest speakers Elizabeth Bartley and Kathleen Norris gave the engaged audience a lot to consider about the current state and potential revitalization of Westwood’s historic business district. Slides from the presentation appear in the previous post. The Coalition welcomes comments on this post or via email at revitalizewestwood@gmail.com. – Westwood has a sizeable concentration of families and people in their productive or working years. – There are more marrieds with children, fewer singles, and fewer elderly than Cincinnati generally. – In 2010, the median Westwood property value was $115,162 while Cincinnati’s median was $129,700. – Westwood has a larger concentration of affordable housing that’s not in decline. – In the area surrounding the historic business district and in Westwood, generally, there is quality housing stock. – An inventory of businesses in the historic neighborhood business district shows speciality businesses, solid services, and regionally known and attractive businesses, many of which are locally owned. She noted that the Westwood Coalition has generated very strong community engagement, now acknowledged by city officials as a model of civic engagement. She pointed to the strong public-private partnerships, as evidenced by the Coalition and city planning processes, the organizations and businesses participating in the Coalition, and, notably, the city and private funding of Madcap’s renovation, with City Council’s commitment of $500,000. Ms. Bartley pointed to the long-time pride of place and neighborhood activation evident in recent years, commenting on the visible, vital sense of place. Next, Ms. Bartley discussed the potential economic impact of Madcap Puppets as it brings 40,000 people a year to Westwood. Consumer spending associated with arts and cultural venues is $26 per person for locals and $40 for non-local visitors. This is in addition to spending specifically related to the venue, like ticket sales. This means that Madcap is expected to bring $1.2M in spending per year to Westwood’s historic business district. Ms. Bartley went on to note that Madcap performances will largely beout on the weekend and that new businesses will be needed to meet event attendees’ needs. She also pointed out the tax revenue associated with the anticipated growth in business activity. Then Ms. Bartley briefly discussed the importance of the Coalition’s revitalization strategy, based on the neighborhood’s strengths and character and informed by the community’s answers to the questions “who are we?” and “what do we want?” She gave attendees food for thought including the importance of the gateways into the business district and the critical importance of focusing on the middle zone (or Main+Main) first. Ms. Bartley ended her remarks with points about the character of the historic business district: the civic heart, a walkable, compact area, good storefronts, good attractor businesses, and gaps and vacancies as opportunities. Next, Kathleen Norris of Urban Fast Forward spoke about the way forward. She asked a number of attendees what they want from this meeting and from revitalization. Comments included a better sense of the timeline, safer streets, reductions in evidence of drugs, more police presence, people out on the street and shopping and socializing. concerns about failing businesses, and concern about the Heartbeat Motors building. Ms. Norris pointed out ways to address the noted concerns, including traffic flow, eyes on the street, and busier shops. All of this will reduce robberies and burglaries and will strengthen community. She emphasized that change won’t happen overnight and will require ongoing engagement. She, too, spoke of the importance of a plan, but cautioned that the community shouldn’t take forever; a lot of the groundwork has been done. Ms. Norris referred to Madcap Puppets as an anchor organization and encouraged attendees to see revitalization radiating out from there. She noted that the Coalition and businesses should understand who those 40,000 Mapcap visitors are and plan for them. Further, she commented, a business cannot thrive on weekend business alone, so she challenged attendees to use our own business district. Ms. Norris cited the competition from the Cheviot restaurant and bar district and shops and big box stores on Glenway but she emphasized that this neighborhood can support its own business district and approach. She commented on the benefit of volume and competition, remarking that, for example, Henke Winery would benefit from two more restaurants in the area. In response to a question about the causes of negative impacts on neighborhoods like this one, Ms. Norris cited the historic shift to suburbia and the automobile. She noted that crime follows; it doesn’t lead. She also pointed to the trend away from suburbia and to urban centers and neighborhoods, preferred by young professionals. Next, in response to a comment about problems caused by movement of residents from Over-the-Rhine to Westwood, Ms. Norris remarked that every neighborhood thinks it has riff-raff and it’s not a direct correlation, in any case. She encouraged Westwood residents to look to positive drivers and make community-building decisions, avoiding narrow-mindedness and futile dwelling on the past. She said that it’s not an unmovable issue and encouraged attendees to work on it in positive ways. She also remarked that Westwood has fewer young people than Cincinnati, generally, which she described as doom if the middle age demographic remains predominant. She pointed to young professionals and said that’s exactly what Westwood wants — young people who want to make a home in Westwood and who are engaged and community-minded. Next, Ms. Norris pointed to Westwood assets, saying that we have a catalyst, space, tools, capacity, and community redevelopment and asset organizations. Illustrating her point with a story, Ms. Norris commented that a community has to support the heart of its neighborhood. She encouraged residents to be clear about what it wants, as has been happening through the Coalition’s efforts. An attendee asked for clarification about housing values, noting the 2010 census data, and commenting that the values continued to decline. Ms. Bartley noted that for the purpose of Madcap’s economic impact study, the 2010 data are important for baseline. In response to a comment about Westwood’s strategic plan, the speakers clarified that a neighborhood-wide strategic plan is different from a revitalization plan for a specific business district and requires a different approach. An attendee spoke of her dislike for the form-based code and commented on the Ruehlmann building, expressing concern about some tenants. Ms. Norris commented that neighborhoods were ignored, nationally, for fifty years while the suburbs flourished. She emphasized that it will take time, collaboration, and effort for the business district, and urban neighborhoods, generally, to turn around. She pointed again to the importance of welcoming young professionals, families, and the elderly to Westwood, noting that the value of properties in Westwood is attracting professionals. An attendee asked about mechanisms for attracting private funding. Ms. Norris and Ms. Bartley both pointed again to the importance of a revitalization plan, such as those in the works in Westwood now. Ms. Norris pointed to the recent commitment of $500,000 by the City of Cincinnati to Madcap Puppets, as part of a public-private funding partnership. She commented on the Westwood Coalition’s commitment to and active engagement in revitalization planning, noting that one can see positive momentum in Westwood and remarking on the work Westwood has done to express what it wanted for its neighborhood business district and gaining more neighborhood control, as a result. A question about the old firehouse at Epworth and Junietta prompted an introduction of Gerald Fortson from Cincinnati’s Trade & Development department. He announced that the City is on the verge of issuing a Request for Proposals that includes criteria intended to show respect for this historic building in the heart of the neighborhood business district. Further, Mr. Fortson noted that Westwood Historical Society and Westwood Civic Association have been invited to have a representative review proposals for the firehouse. Remarking again that revitalization takes time, Ms. Norris illustrated this point by offering the example of Over-the-Rhine where it took three years and buckets of money to develop thirty five residential units and eight or ten stores. An attendee who is a real estate developer noted that there is tremendous value in a rising market. Ms. Norris ended her remarks by saying that the important thing to keep in mind is that Westwood got into the revitalization mix several years ago. This progressive movement is creating momentum and moving Westwood forward. She urged the Coalition and the community to go after what it wants and to recruit strategically. At the Westwood Coalition community meeting on December 2,Cameron Ross, senior city planner, presented the refinement of the Westwood transect map, reflecting the proposed application of the Cincinnati Form Based Code to Westwood’s historic business district. We will post notes from that meeting later this week but here is the transect map as presented and as it will be recommended to the Cincinnati Planning Commission on December 13, 2013. Click on link below. Please comment or post questions here or to the Coalition’s email address.